Doha isn't perfect. Not by a long stretch. It has indeed caused me more than one headache on occasion. The constant construction, the crazy driving (refer to last years post on that one!) the heat, the sand storms, the traffic, the grocery shopping, the lack of labour standards for many of its workers, the idiosyncrasies of the Qatari people... my list could go on. But, I must say that I have found my Doha groove these last few months, and generally speaking, its been smooth sailing lately. Fun even. Someone please touch wood for me. I didn't think it would happen, but folks, we have settled in rather nicely. House is lookin' more like a home, we have favourite restaurants, have made some genuine friends in our neighbours, my shelves are stocked with ample whatnots because I now know where to shop, picked up a few arabic phrases to get us by in a pinch, the garden is...passable. My point is - we've acclimatized. Every once and a while, however, something - maybe not even a 'big' thing - will happen, and it shocks me back into the reality of where I am and how absurd this place can really be at times. Doha has laws and regulations, like any major city. Do they make sense? Sometimes. I think seeing 'sense' in certain laws is entirely dependent on WHO you are and where you come from. I try to make a point of not getting too much into various customs, religions or politics when I write (there are enough blogs out there for that), but I must chat about my morning at Qtel for just a moment. Qtel has the monolpoly on telephone, internet and cable services in Qatar. We therefore have our mobile phones, home phone, internet and cable accounts with them. Fortunately, most of what we have had to do with our accounts has been able to be accomplished online. 1. Our monthly statements have been coming to our house addressed to the C. Ghisholm. Colin got a kick out of it, as I think he is fairly used to people misspelling our last name, but it irked me and I said if I ever had to go into Qtel personally, I would fix it (it's only taken me a year!). 2. We want to upgrade our internet speed. "You need to bring your Sir, Ma'am." "Your Sir... umm, husband... please bring him in to do this"
"Well, my Sir will never be able to get down here during business hours just to fix one letter in our name and upgrade our internet speed, but I am here now, so I want to do it." "Please get me your manager". So, after another wait, an impressive looking Qatari saunters over to our counter. I explain what I want help with. 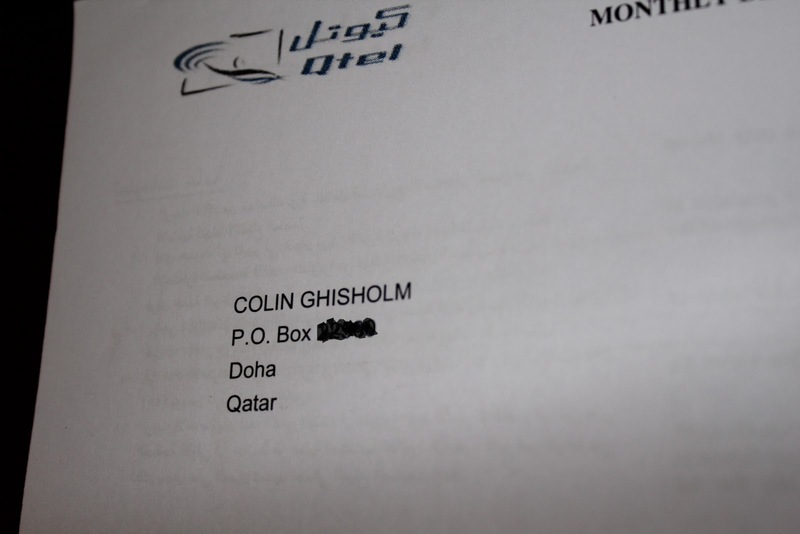 He takes a hard look at our phone bill, and then at my Qatari ID card (with Chisholm clearly spelled out on it), and I sweetly repeat my request to have the letter changed from a G to a C in our family name. I tell him I understand the account is in my husband's name (with mine as a secondary), but he has asked me to do this for him (seriously - I said this). He didn't bat an eye - "No". What does he mean, NO? I ask why and he says that my husband needs to sign a form. I repeat how I am here now to sign the form for our account. It went on like this for a few minutes, and finally, against all odds, I partially win. The Qatari manager instructs the customer service guy to photocopy my drivers license, my Qatar ID, and one other form of ID, and I have to fill out an official looking form requesting their error be corrected. Their error. My customer service guy said he would follow up, but who knows if the G will ever get changed. He said it could take weeks. As for the internet speed... well, I came home with not one, but three different forms for my Sir to fill out and return in person. C had a big laugh at this. How I needed my Sir to get it done. I guess our internet will remain slow for a little while longer... *sigh*... Ahh, Doha. I can totally relate! Sometimes it feels so weird to have to have your husband do things just because he is the 'man' of the house! It works here, but will be refreshing some day to home again and do things with ease once more! I would pay money to have seen your face during this exchange. Serious money. Can't wait to tell my "Sir" about it when he gets home. And, I think Colin is totally getting a "Sir Grisholm" t-shirt for his next birthday gift. This was hilarious. The culture is so male dominating. I can just vision the expression on your face when , the man said "NO". When reading it, I was laughting so much. Good Luck! !I enjoy your blog so much!!! Should have made him take Wall. Harder to misspell.